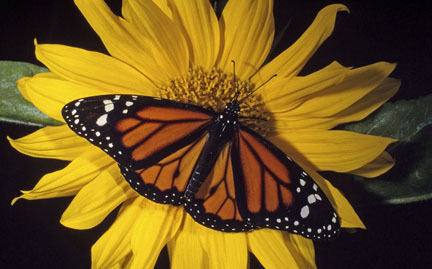 Adult monarchs possess two pair of brilliant orange-reddish wings with a wingspan of about four inches, and they weigh less than half an ounce. The monarch butterfly’s scientific name literally means “sleepy transformation,” which evokes the species’ ability to hibernate and morph. This generation performs the incredible feat of migrating from Canada and the United States to the center of Mexico — after which they begin the northward journey again. Once they reach the United States, a kind of relay race begins: their short-lived offspring, with only four or five weeks to live, continue making the trek northward over several generations.